Life tends to put us into situations that pose questions. The more receptive we are to these questions and the more we pursue answers to them, the more fulfilling our life may become. Sometimes however, we may be presented with a question that overwhelms others that have arisen before them. It is questions such as these that deserve our best efforts to answer them. One such question and my efforts to seek an answer to it is the topic of this article. Some years ago I was trekking alone in the foothills of the Himalayas enroute to the Everest region. It had been 5 days since I had left the nearest road. Being late in the afternoon, and only about half way up a 4,000m pass, I thought that the small Tibetan style monastery, seen ahead, would be a welcome rest place for the night. Assuming of course they would accept me. On entering the monastery, I was surprised to find that it was no longer occupied by monks. Only the very elderly lama and his female carer were in residence. I was welcomed to stay and I soon became aware that the lama was continuously chanting the Tibetan mantras, intended to smooth his passage towards rebirth. Two tiny cymbals that he held in his hands were being clashed together repeatedly as he recited the mantras. Times were obviously hard, but I was welcomed to stay. I had no idea at that moment that I would soon be presented with a question that would profoundly trouble me. Daylight was fading and it was time for the evening meal. The three of us sat next to the open fire at one end of the single room that served as kitchen, dining room, recreation room and communal bedroom. The small log fire provided some warmth and the rest of the heat went into the rice pot suspended over it. Despite the room being only a few paces wide, I could not see clearly how the room was furnished, partly because of smoke from the fire and also partly because the only windows were glass-less carved wooden screens and some of these had their storm shutters tightly closed. This mountainside was no sun-drenched holiday destination. Soon I was served a huge mound of rice with a few sliced potatoes and a small spoonful of green vegetable placed on top. My rice portion seemed to have been scaled according to how much climbing they knew I must have done that day to reach this place. But, whilst I tried my very best to mix the rice with as little vegetable or potato as possible I was eventually left with a plate of rice that would still be more than a normal restaurant would serve. Even the lama had finished his plate of rice, despite his constant mantra chanting, that only ceased when he was actually chewing. The cymbals were also now back in use. I thought for a moment how much easier my task would be if I had a bottle of tomato ketchup to flavour the rice. A few seconds later the woman next to me rose to her feet and disappeared into the darkness behind me. I ABSOLUTELY KNEW that she was fetching some tomato ketchup. The feeling of relief was overwhelming, my problem had been solved. She then presented me with an unopened bottle labeled "Tomato Katsup'". It was a few spoons-full of very tasty tomato-flavoured rice later that I suddenly questioned myself as to what had taken place: I had simply wished for something to happen and not only had my wish been granted but I had ABSOLUTELY KNOWN that it had been. No explanation was offered by the lama or his carer as to what had taken place, and in the absence of any common language, I could not realistically request one. I left the monastery the following morning. As the weeks and months went by this event continued to haunt me. The production of the sauce was not really the issue for me – after all the spelling of "Katsup" as opposed to 'Ketchup", indicated an Asian as opposed to European origin for the sauce. But how was I so ABSOLUTELY CERTAIN in this isolated monastery, nearly 3,000m up in the Himalayas, that my wish for something so out of local context had been granted? I just KNEW I was getting it. On eventual return to the United Kingdom, I remained troubled. I felt I needed to go back to this monastery and search out an answer. So, almost 12 months after the initial event, I found myself again 5 days out on the trail and approaching this monastery for a second time. Only the timing was different - it was late morning. Little appeared to have changed. The same woman greeted me and whilst common language was still a problem, I learnt that the lama had died. She appeared to be there alone. During the course of the next hour or so, I was unable to establish any real clue as to what had happened during my initial visit. Rightly or wrongly, I came to the conclusion that whatever the reason was, the answer lay within myself and not within this monastery. I felt that the appropriate thing to do now was to express my thanks once again and to leave. So years later, I still recall that attempt to seek out an answer to my question. The question remains unanswered, though time has dulled the effect upon my mind. It no longer 'troubles me' but I still see it as a problem unresolved. Perhaps I could have spent the intervening 12 months learning the local language before returning to the monastery. Sometimes our search for an answer fails to yield a conclusive result, but that does not mean that a fruitless search was in vain. Sometimes the opinion of others can shed some light or provide some clue. What do you think happened that evening? My spiritual Master had always told me that we are all connected. There is only one Universal Mind and what we think actually affects the thoughts of others. The frequency or ripples of thoughts become stronger in a serene and peaceful place, which I believe the monastery is! So, you emitted a strong wave of wanting the tomato ketchup, which the woman was subconsciously compelled to get up and provide you with one. Simple as that. Sometimes things just happen. This is what we call "coincidences". If the author could get to that monastery, who knows if other travellers had been there before and gave them this bottle of "Katsup". Afterall, it is a monastery. I don't understand why did such a question bother you until you had to go back there? We all have intuitive feelings. And quoting Viviene, in such a serene environment, your intuitive faculty was amplified and you just knew that she was gonna get you the bottle! good write-up and good question. it's simply law of attraction! you think about something, and was convicted in your belief that it will come true, so it did!!! Nice story you have written there. You are quite an adventurer. Have been following your stories for quite a while. Keep it up. Niceeeeeeee! I would like to visit this place. Where is it? Maybe I can find the answer for you? Thank you all for your interesting comments. Viviene K; Penny James and Anonymous : It was not the appearance of the sauce bottle that bothered me - afterall it was available in a few Kathmandhu shops so could have reached there with some effort by somebody. Yashvardhan Raj; Freeman and mandygirl : I spent about 6 weeks in Nepal with absolutely no time schedule for anything and I was aware even after I left that I had become very mentally relaxed. perhaps that was a contributing factor. Ely : I would have to dig out my maps but it is on the old trekking route that Everest climbers used to follow to reach base camp. Nowadays they travel by road or fly in to an airstrip. It's unlikely the elderly woman is still there. 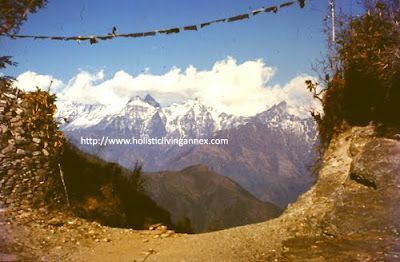 The photo shows the top of the pass above the monastery and that valley leading towards Everest is the Dudh Kosi Valley which ends at the sherpa town of Namche Bazar. It's a spiritual story concerning various issues. 1) To what extent are we all really psychic? 2) How do we really influence our surroundings with our minds? I guess it is a fairly thin line to draw between each. No conclusion at all. Puzzling!